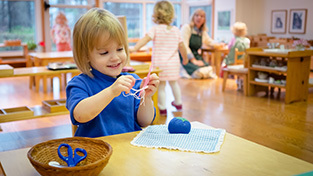 A Montessori education sees the child, not as an empty bucket waiting to be filled with knowledge, but rather as a unique human being who most often has accurate instincts about what he or she needs in order to grow and to learn. 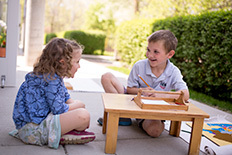 Montessori school children undertake ambitious studies of their own initiative, show immense pride upon the completion of a project, and are eager to show what they have learned to others. Our mission is to support each child’s emerging intellect and nurture his or her human spirit. The Forest Bluff educational environment fosters self-discipline through the opportunity to exercise freedom appropriate to the child’s developing sense of responsibility. As such, our students exhibit strong character, perseverance, integrity and respect for others, as well as a passion for life itself. Forest Bluff School maintains that child development is not linear but occurs in four distinct “planes” of approximately six years each. During each plane, the child possesses individual characteristics and needs best suited by a specific environment and supportive, well-trained adult. Children remain in the same classroom for approximately three years, allowing close and trusting relationships to develop. “Perseverance, Risk, Trust, Independence, Leadership, Responsibility, Friendship.” These are the words chosen by students at their recent graduation ceremony to describe their years at Forest Bluff School. What kind of 14-year-olds could stand before parents, friends and classmates and share their most intimate thoughts and assessments about the whole of their education from its earliest years as two-year-olds to the present? And how could they do so with such ease, confidence, humor and obvious enthusiasm for life and learning? To answer these two questions is to understand both Forest Bluff School and traditional Montessori school education. Our interest in founding Forest Bluff School was to better understand the nature and purpose of childhood itself, and how best to serve the human spirit within the child in his or her foundational years. Two of us already had many years of experience teaching in public and private schools. We were dissatisfied with the stress and competition experienced by our students, and the constant shifting of educational fads and curriculum in these schools. Familiar with Montessori Education, we decided that its approach to children most closely meets their needs for healthy development. We decided to become Accredited AMI Montessori teachers by taking a primary course at the Montessori Institute of Milwaukee in 1982. In the same year, we co-founded Forest Bluff School and were joined by an experienced AMI Accredited Montessori school teacher who opened our first class with fourteen 3 and 4-year-old children. In subsequent years, we each started our own classes quickly growing to an elementary and Secondary Level school of 140 students and a teaching staff of 12 Accredited AMI teachers. Discovering that this size proved optimal for realizing our goals and philosophy, we eventually purchased land and built our own building based upon it. Custom designed for us by award winning architect, Larry Booth, our light-filled building is located in a unique natural environment of prairie grass and trees. Originally, our goals and philosophy did not endorse traditional Montessori Education in total. In fact, as co-founders we did not include Montessori in the school’s official name. We wanted to see if we would want to modify some of Montessori’s original principles and practices. Montessori had made very explicit claims about the success of her methods in 1946. Would they hold true today? We determined to see for ourselves. 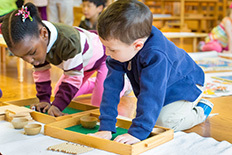 We would “follow the child”, as Montessori herself did, observing and guiding him or her in the carefully prepared environment prescribed by Montessori. This environment was designed to meet the specific needs of children in every area of human development from immersion in nature to art and music, athletics, academic knowledge and living in community with others. Having “Montessori” in the title of our school would not be authentic if we wanted to make fundamental changes or modifications to any aspect of this environment. This is the essential question of course. We have found, as Montessori did before us, that children have an innate interest and curiosity about the world around them. Help them to develop their abilities to explore it and the means to do so, and they astonish with what they achieve and at what age they do so. These responses of visitors alone suggest that we have succeeded in our purpose of building a school that truly serves the human spirit within each child. Validation from the educational community and world at large is important as well. Our students have gone on to high schools, large and small, public and private from New Trier to Lake Forest, from St Paul’s School, a boarding school in New Hampshire, to Lake Forest Academy. They have made outstanding records at each of their high schools whether in academics, athletics or community leadership. A list of our students’ colleges in the most recent years includes Stanford, Duke, Yale, Princeton, Northwestern, Claremont McKenna, Colorado College, University of Pennsylvania, MIT, Middlebury and Williams. As to our college graduates, they are engaged in every area of human endeavor from medicine to law, business to the arts and teaching, technology to philanthropy, military service to environmental science, engineering to public relations. The wide variety of talents and service, and the enthusiasm and happiness with which they are giving them to the world, makes us proud of our Forest Bluff School alumni. Most importantly, it helps us to realize that Montessori was right. Our children are indeed “the hope and promise of humankind.” They need our help in their formative years with a wise educational approach if they are to realize that promise. But if we do our part for each individual and unique child from his or her earliest years, the achievements of the human spirit are infinite. Forest Bluff fostered a love and fascination for learning that has helped me tremendously in high school. 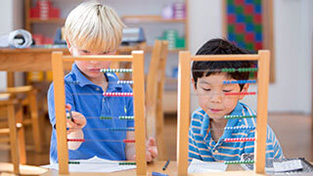 With my strong Montessori foundation, I can connect concepts on my own, which helps me understand material and makes learning more fun. After having children enrolled at Forest Bluff School for almost 10 years, the school continues to exceed our expectations of what excellence in education can and should be. The invaluable life skills our children acquired at Forest Bluff – work ethic, time management, leadership, collaboration, empathy, confidence, and respect for others – have had a profound impact on their success. In my 15 years of teaching, some of the best English students I have encountered have been Forest Bluff alumni. Their drive and excitement about learning, reading, and writing remained a constant.